On the 21st of April I mentioned that we had started building our sensory room (click here for original post). We have now done a lot more than start! It feels like it is almost finished and hardly even started at the same time! We now have all four walls up. An internal door has been built. The window and sliding door are in. The hardiplank is on the outside of the walls and insulation is in most of the inside walls and waiting for ply (we chose to use ply on the walls instead of gyprock as it is stronger and will take a beating better). The electrical cables are in place. It’s at lock up stage. Yesterday while the kids were with their “Aunty and Uncle” (from a respite program), Grumpy and my Dad fixed the one part of the eaves that needed replacing and pulled down half the ceiling. I helped pull down the other half which was a lot of fun. Grumpy and I then had the ‘fun’ job of pulling out all the nails from the rafters and Grumpy scraped off the old glue (he had the worst job). Today Grumpy and I put the one piece of ply we had up. We will then be able to start putting everything in! 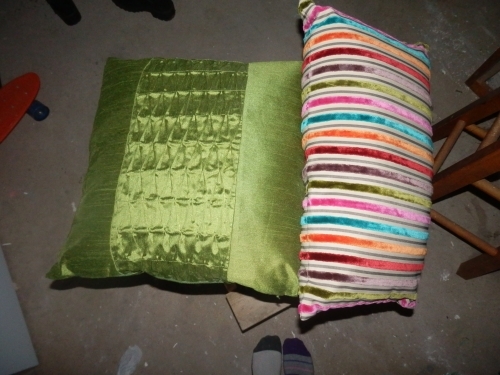 I have made a few cushions (and bought a few) that have different textures. We got a clock from our local $2 shop which is closing down, as well as a hammock to hang up as a sling swing. We need to build the castle. We have realised that we won’t be able to have a slide on it as we are short on room but we are still having rock climbing grips to use to climb onto it and a dark area full of cushions and soft things underneath. 1. We NEED the storage space! 2. They will be flat packed – I love putting together flat pack furniture. Yep, I’m crazy. I love flat packs and I wear odd socks. Deal with it! This entry was posted in ADHD, Autism, Crafty things, Sensory Room and tagged building, carport, pillows, playroom, sensory gym, sensory room, swings. Bookmark the permalink.